Railcars that were supposed to be delivered to Long Island, New York last week to haul away stockpiled municipal garbage were sent to New Jersey instead, further delaying the removal of an estimated 5,000 tons of waste. 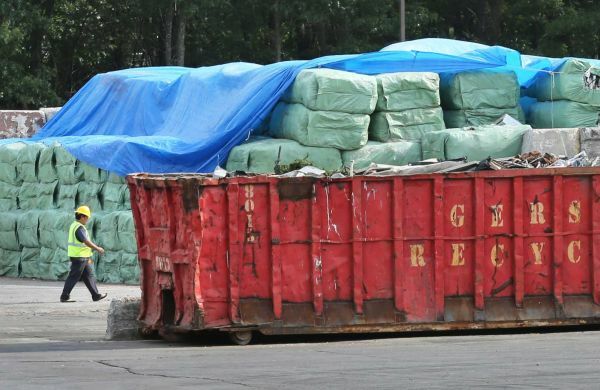 Some waste-management companies earlier this month notified their Long Island customers that until the backlog clears, their waste could no longer be accepted. The stockpiles of baled garbage were being stored at transfer stations at several collection and transfer facilities. When the railcars arrive, the trash is to be loaded onto the empty railcars and then the baled garbage would travel via LIRR tracks to Queens where the railcars would be switched onto a train and taken to a landfill in Kentucky. The trash buildup is caused in part by an increase in the number of tourists and seasonal residents flocking to Long Island in the summer, overloading garbage-handling facilities in recent weeks. The transfer facilities used for processing the waste and the flatbed trucks used typically to drive the waste to landfill have been unable to keep up with the volume of garbage coming in. So, to alleviate the backlog, railcars were authorized, temporarily, to carry garbage off Long Island. Food waste now has to travel farther from your kitchen garbage can to its final resting place, and longer trips mean more greenhouse gas emissions. Train trips generate approximately 40% more carbon-dioxide equivalents than the methane the garbage would have released in its first year at an in-state dump. While NY State has only a capacity at their state landfills to last only 25 more years, most of the states garbage must be shipped across state lines. Kentucky happens to have room for 212 million tons of waste and sees the acceptance of this waste as an economic opportunity, but for the environment a doomed misfortune. New York needs to push smart food waste disposal processes onto their largest generators in order to keep more than 30% of their waste off those rail cars. On-site aerobic technology is a solution New York should get behind sooner than later, a 700 mile trip for disposal makes no sense. This entry was posted in Environmental Concerns and tagged Eco-Safe Digester, Long Island Garbage, On-Site Aerobic Digestion, Railcars to Transport Garbage on July 29, 2014 by Lisa Giovannielli.